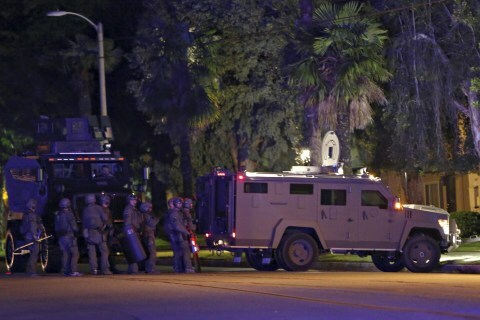 Full coverage of the mass shooting in San Bernardino, California, which has left at least 14 people dead. They lived quietly. The husband worked a regular job. The couple apparently even created an online baby registry at Target . Enrique Marquez Jr. faces up to 25 years in prison for supplying the guns used in 2015 by Siyed Rizwan Farook and his wife. Mariya Chernykh posed as the wife in sham marriage to Enrique Marquez Jr., who is accused of buying the guns which were later used in the attack. A patrol sergeant driving the wrong way tipped off the husband-and-wife killers that police identified their vehicle, and gave them time to prepare. A controversial federal proposal to ask people visiting the country under the visa waiver program for their social media handles has come under fire. The two policies, owned by Syed Rizwan Farook, were worth a total of $275,000 and listed Farook's mother, Rafia Farook, as the beneficiary. Federal officials issued warrants on Thursday in relation to the deadly San Bernardino mass shooting. The new charges are not terrorism related. The FBI has agreed to help an Arkansas prosecutor unlock an iPhone and iPod belonging to two teenagers accused of killing a couple. President Obama made a passionate case for mobile devices to be built in a way that would allow the government to gain access to personal data if needed to prevent a terrorist attack or enforce tax laws. Apple has argued that if the password had not been changed, it is possible that the current case unfolding in California might have been avoided. The FBI wants Apple to build a piece of software that would then be loaded onto an iPhone used by one of the shooters in the San Bernardino massacre. Apple and the FBI are battling over an FBI request to access a locked iPhone. "I support Apple and the decision they have made," wrote Salihin Kondoker in a letter of support to U.S. Magistrate Judge Sheri Pym. Apple and the FBI faced off in a hearing before the House Judiciary Committee on Tuesday afternoon. Microsoft, Google and Twitter all have plans to file in court in support of Apple’s position not to comply with the court order issued on Feb. 16. Apple has filed a motion to vacate a California magistrate judge’s order that would make the tech giant help FBI agents access an iPhone. FBI Director James Comey said Thursday that forcing Apple to give access to one of the San Bernardino attacker’s phones troubles privacy activists. Lawmakers questioned the nation’s top intelligence officials about a court order being contested by Apple, as well as the larger debate over encryption. “Several” victims of the December attack in San Bernardino will side with federal government in its escalating battle with Apple over an encrypted iPhone. Fifty-one percent of people surveyed said that Apple should assist the FBI in accessing an iPhone 5C used by San Bernardino shooter Syed Farook. Apple chief executive Tim Cook defended his company’s position in its fight with the government in a letter to employees on Monday. The search of a Corona, Calif., apartment comes as investigators try and learn more about why a couple killed 14 people in San Bernardino on Dec. 2. Sundar Pichai said in a series of tweets that a judge's order would put tech companies in the position of helping the FBI hack their own customers. Apple is opposing a court order to unlock the iPhone used by one of the San Bernardino shooters, accusing the federal government of an "overreach." The full text of Apple CEO Tim Cook's open letter to customers. A federal judge ruled Tuesday that the computer company must help investigators gain access to data on Syed Farook's iPhone 5c. The FBI calls the problem "going dark," and Director James Comey said it impacted all levels of law enforcement. Enrique Marquez, accused of buying rifles used in last month's massacre, pleaded not guilty to conspiring to provide material support to terrorists. Investigators are trying to figure out where Syed Farook and Tashmin Malik were for 18 minutes after their attack on the Inland Regional Center. Few of the Inland Regional Center employees have gone to the office since the Dec. 2 terror attack, other than a brief visit to gather personal belongings. On Monday, they return. Enrique Marquez, 24, is charged with buying two of the guns used in the Dec. 2 attack that left 14 people dead, as well as other counts. A judge said terrorism-related charges indicated that Marquez — who bought the rifles used by Syed Farook and Tashfeen Malik — could be a threat. Memorial services were held Saturday for two fathers killed in the San Bernardino massacre: Nicholas Thalasinos and Michael Wetzel. President Obama and the first lady stopped in San Bernardino en route to their holiday vacation. The emergency order helps the San Bernardino Department of Public Health with staffing and waives death certificate fees for the victims' families. 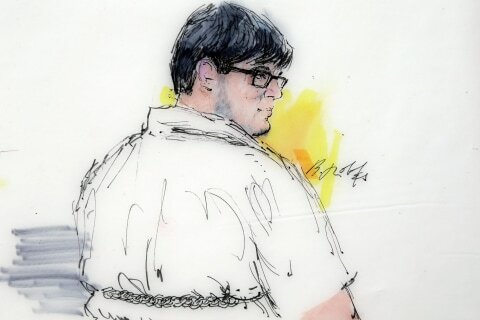 Enrique Marquez was charged Thursday with buying the rifles used in the assault and plotting other terrorist attacks with Syed Rizwan Farook. Enrique Marquez admitted on Facebook — a month before the San Bernardino shootings — that he was involved in terrorism, court documents allege. Investigators have said Marquez bought the two assault rifles three years ago that wound up being used in the shooting. Syed Rizwan Farook and Tashfeen Malik were buried in Southern California on Tuesday afternoon, representatives of Farook's family said. The Inland Regional Center, the scene of the San Bernardino terrorist attack, is set to allow employees back into two buildings on Jan. 4. The FBI director says Tashfeen Malik and Syed Farook communicated in "private, direct messages." Citing San Bernardino, 22 lawmakers on Tuesday urged Homeland Security Secretary Jeh Johnson to start reviewing visa seekers' social media posts. The White House met with Muslim and Sikh leaders to discuss fallout from San Bernardino shootings. 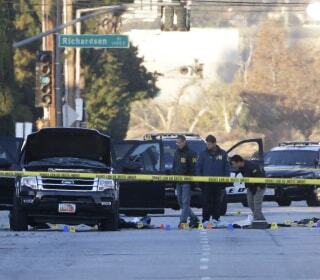 After the San Bernardino attack, investigators found out that Tashfeen Malik had discussed violent jihad on social media prior to her visa approval. Family, friends and co-workers attended a funeral service Monday in memory of San Bernardino shooting victim Benneta Betbadal. Nothing in the 23 years Capps had been on the job could have prepared him for Dec. 2. "I just don't try to think about him," said Jennifer Stevens of Syed Farook, who, with his wife, gunned down 14 people in San Bernardino. It’s possible that going forward, social media posts will be scrutinized in the process of vetting people for U.S. visas, John Kerry said. The guns, ammo, bomb parts and rented SUV assembled by San Bernardino killers Farook and Malik cost just $4500, according to an NBC News analysis. The New York Times reported that while Tashfeen Malik passed three background checks by immigration officials, her social media accounts were ignored. Shannon Johnson received a hero's funeral Saturday 10 days after he died during the massacre in San Bernardino, California. It was not clear what they expected to find. Friends and family gathered in Covina to mourn 27-year-old Yvette Velasco. Syed Farook was discussing staging a terrorist attack in the Los Angeles area with a neighbor as early as 2012 but got cold feet, investigators said. The father of San Bernardino shooter Tashfeen Malik on Wednesday said he was saddened by the terror attack and does not know why she took part. 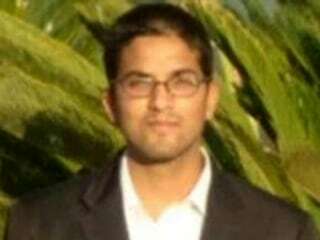 News that San Bernadino shooter Syed Farook received funds through online lender Prosper Marketplace Inc. has raised eyebrows. The cop in a video calming survivors of the mass shooting — promising "I'll take a bullet before you do, that's for damn sure" — came forward. Several sheriffs are urging Americans to take the fight against terrorism into their own hands in the wake of the mass shooting in San Bernardino. 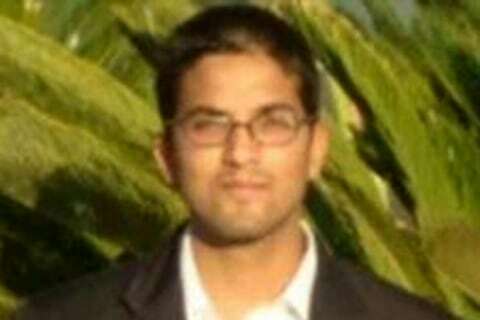 Did the San Bernardino Shooters Syed Farook and Tashfeen Malik Have Help? Investigators are looking for any associates, suppliers, trainers or financiers who may have helped mount the San Bernardino terror attack. Mourners gathered solemnly Monday night for two candlelight vigils in San Bernardino, Calif. to remember people killed in a mass shooting last week. Hundreds of mourners gathered for two candlelight vigils in San Bernardino to remember 14 people killed in a mass shooting last week. Speaking in the flat tones of people who have seen too much, Corwin Porter and Trudy Raymundo, recalled the horror that took place Wednesday, Dec. 2. 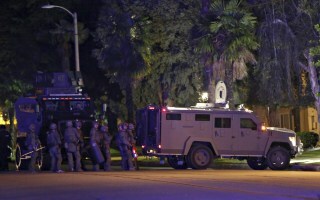 Syed Farook was using an assault rifle that looked similar to the one used in the attack. "We have learned and believe that both subjects were radicalized and had been for quite some time," an FBI official said Monday afternoon. Enrique Marquez is not considered a suspect in the attack. A government photo released Monday shows newlyweds Syed Farook and Tafsheen Malik entering the U.S. 16 months before their California gun rampage. San Bernardino County employees who survived the deadly attack at Inland Regional Center in California discuss the shooting that killed 14 colleagues. In only his third address from the Oval Office, President Barack Obama said the U.S. is equipped to meet the "evolving" threat of terrorism. Tashfeen Malik was admitted to the United States through what's called a K-1 visa for foreigners engaged to U.S. citizens. Attorney General Loretta Lynch said Sunday that the FBI is looking into whether the mother of one of the San Bernardino attackers knew anything about the shooting in advance. President Obama will make a rare address to the nation on U.S. efforts to combat terrorism after attacks at home and abroad have Americans questioning their safety. The woman who, with her husband, gunned down 14 people at his office, was described by a family member on Sunday as seemingly "innocent." Attorney General Loretta Lynch previewed the president's terrorism address Sunday morning and provided updates on the San Bernardino investigation. Sens. Lindsey Graham & Rand Paul weighed in on what steps should be taken by the federal government in the wake of the San Bernardino attack. For some of those who did know her, including an aunt who spoke to the AP, knowledge of some aspects of Tashfeen Malik's life were secondhand. Residents were reeling after a couple who had lived seemingly-ordinary lives carried out Wednesday's deadly attack. Obama will discuss the investigation into the attack in San Bernardino and also "the broader threat of terrorism ... and how we will defeat it." A San Bernardino mosque leader said investigators questioned him about texts he exchanged with Syed Farook, but they were only about food donations. On Saturday authorities searched the home of Enrique Marquez, a man they believe bought the rifles used by in Wednesday's attack in San Bernardino. The words "I got you" haunts survivor Denise Peraza, who was protected by co-worker Shannon Johnson before he was killed in Wednesday's attack. A package was flagged after a UPS driver noticed the shipment was addressed to the suspected San Bernardino shooters. A radio morning report recounts the slaughter in San Bernardino, and asks for "Allah to accept them (the shooters) among the martyrs." More than 80 percent of weapons involved in mass shootings over the last three decades have been purchased legally, like they were in San Bernardino. The Times is using space on its front page to call for greater gun regulation in the wake of recent deadly mass shootings. The invoices do not say what was purchased from Cheaper Than Dirt in Fort Worth, which according to its website is a gun discounter. The gunman who turned a San Bernardino holiday party into a mass murder scene with his wife had complained that his co-workers made fun of him. Their jobs were to keep the people of San Bernardino County healthy. They died together on Wednesday, shot to death at an office holiday party. In a crime riddled with unanswered questions, the newly Americanized housewife who made little impression is the leading mystery. The Redlands, Calif. home where San Bernardino shooting suspects Syed Farook and Tashmin Malik lived was opened to reporters by the townhouse’s landlord. Syed Farook and Tashfeen Malik had the ingredients for three more remote-control bombs at their California home when they were killed. The magazine's cover features a couple stocking up on firearms and weapons — tossing the items into a shopping cart as if they were on a grocery run. 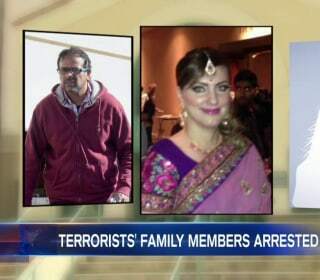 Investigators are looking into whether she was the radicalizing influence in the life of her husband, Syed Rizwan Farook.